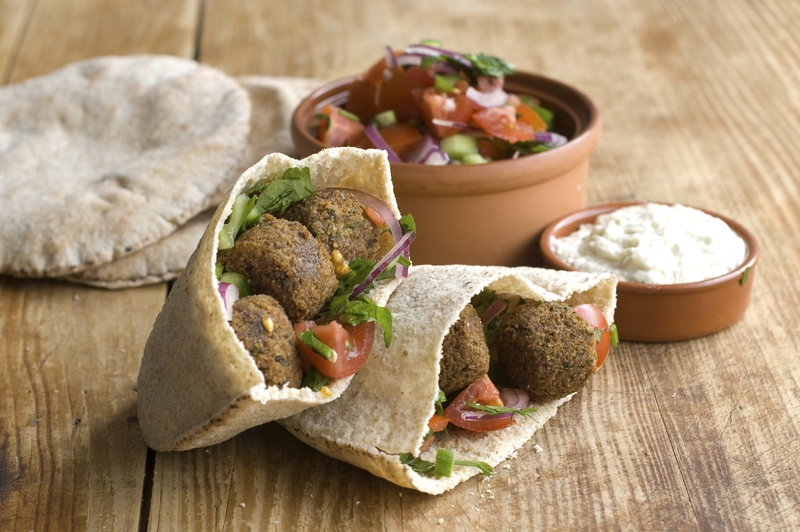 Falafel in pita bread – yum! I’m in my eighth month now of not eating dairy, except for some sprinkles of Parmesan cheese, maybe once or twice a month. I’ve gone eight months with no beef, chicken or pork but still enjoy seafood occasionally. And, I eat eggs, but maybe only a couple of times a week, or in an otherwise vegan baked good. I guess I’m an “almost vegan,” or a “not quite” vegan. Or maybe I’m a “flexitarian,” the term Mark Bittman came up with for those that mainly follow a vegan diet. I occasionally eat some commercial vegan products these days, such as Gardein’s Meatless Crispy Chicken nuggets and Meatless Classic Meatballs (I can find both at Costco), vegan Italian sausages and hot dogs from Field Roast, Morningstar Farm’s breakfast sausage patties, Amy’s vegetarian chili, and Boca’s All American veggie burgers. I use them mainly so I can eat the same meal as the family, rather than having to fix myself something different, although that still happens from time to time. But, often I just skip the meat or a substitute altogether, and serve myself before the meat is added to a dish. I’ve so far not used vegan “cheeses” mainly because I think they taste awful, or other vegan meat substitutes like the “meatless beef tips,” “meatless chicken strips,” or “meatless bacon” I’ve seen at Safeway and other natural food stores (or products like Tofurky sliced “meat” for sandwiches). I just don’t miss meat or cheese so much that I’m clamoring to find substitutes for everything. I understand that many others like, enjoy and use these vegan products, but they just don’t do anything for me. I’d rather focus on whole grains, vegetables and fruit than finding a substitute for meat. I’m lucky as well that my family enjoys vegetarian or vegan meals, and doesn’t complain when I do something like substituting crumbled tofu or a ground “meat” substitute in a recipe. They’ve been a fountain of support, and helped make it easier for me to stick with the dietary changes I’ve made this year. Tuesday (this evening): Mabo nasu (eggplant) with steamed rice; sliced cucumbers. I’m substituting crumbled tofu for the ground pork in the mabo nasu. Wednesday: Chicken pad thai (no chicken for me), and cucumbers again. We’ll be shopping for tomatoes, cucumbers, cilantro, parsley, and mung bean sprouts at the farmers’ market tomorrow. For the first time we’re going to skip buying bananas because they’re been ripening faster than we can eat them (and it’s too hot to bake banana bread). Last week’s menu came off without a hitch until we got to last night – it was too hot to fix tostadas and no one felt much like eating anyway. Fingers are still crossed that this week’s comes off as planned. Previous Post The Best Thing About Traveling Is . . .
Why did you give up these foods? At the end of last year I did not feel very good, so at the beginning of this year I decided to start with a vegan diet and try it a month at a time, see how I felt and reassess what I was eating. I noticeably felt better at the end of the first month, so decided to keep going. I eventually added back in eggs because I like them and wanted one for breakfast once in a while and didn’t have any problems. I also decided to eat fish/seafood as well because we live in Hawai’i and it’s kind of dumb not to eat seafood here. Otherwise I haven’t missed dairy or meat, although I did just add Parmesan cheese back, because I maybe only have a couple of TBSP each month. I did try goat cheese one month and that didn’t go well so I let it go. I reassess at the beginning of each month whether I want to change anything, but so far I’m happy with how it’s going.